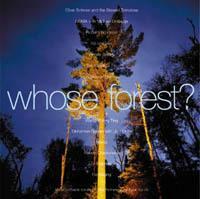 "Whose Forest” is a musical journey from the joyous, to the cool, to the sublime. Featuring the collective voices of some 40 musicians and visual artists, “Whose Forest” was conceived by musician/ activist Sarah Peebles as a tool to raise public awareness of the Ontario government’s “Lands for Life” programme, and it’s potentially catastrophic effect on land usage in the province. She solicited support from some of the finest jazz and avant-garde musicians working in Canada and abroad. A year later, the legislation has been passed. Thanks in part to the efforts of the Partnership for Public Lands (the recipient of all proceeds from the CD), a good deal of Ontario has been designated parkland in perpetuity.We like to think that “Whose Forest” made a significant contibution to the process. Now that it’s role as social activist is done, we hope that “Whose Forest” can find a new and equally successful career as an excellent anthology of creative music. We are broadening our distribution base and approaching the media to re-consider “Whose Forest” solely on its musical merits. A Studio Excelo Production "time-based art with a creamy filling"
A musical journey from the joyous, to the cool, to the sublime. 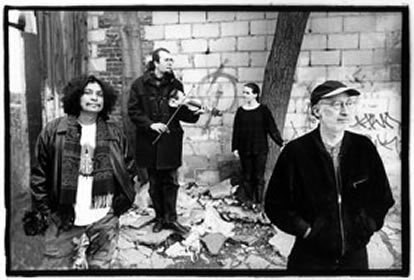 Hornblower Recordings presents Canada's finest contemporary and traditional musicians, composers, and improvisers, with international guests. Benefitting The Partnership for Public Lands. Oliver Schroer and the Stewed Tomatoes: "Earth Logic"
"Full fiddle flavour", with wild voices and South Indian spices. Joyous, danceable music featuring guests Jani Lauzon, Brent Titcomb, and mrdangam virtuoso, Trichi Sankaran (S. Indian classical drum). NOMA with special guest Michael Ondaatje: "desert dog"
Avant jazz with spoken word. Tuneful and cool - an exceptional group performance, with a distinctive blend of poetry, acoustic instruments, electroacoustics and electric guitars. Vibrant percussion by one of Canada's most celebrated chamber groups. Featuring bird whistles and bird-sound-makers collected from all over the world, this piece travels from the enchanted to the raucous, from solemn to absurd and back. The Kavkasia Trio: "Shen Khar Venakhi (Gurian version)"
Traditional sacred chorale from the Republic of Georgia. Praised by the New York Times for their "exotic, beautifully modulated style", Kavkasia sings timeless poetry set to exquisite harmonies. "Haunting beauty". Composed by Liu, Tian-Hua (Beijing, China)Erhu solo (Chinese fiddle). An early 20th-century composition; Chinese traditional sensibility mixes with Western influences. Canada's eminent erhu performer sensitively interprets music by this historic composer. Sheng solo (Chinese mouth-organ); Folk/China. Exuberant and joyous music - a virtuosic performance and arrangement by Australia's prolific sheng virtuoso, Wang, on this fascinating, complex instrument seldom heard outside of China. Improvised clarinet solo. Sensuous, provocative, daring. One of Canada's most riveting performers, Freedman travels the emotional gamut, at times tender, at times brazen, with much in between. Electroacoustic tape; sound ecology work. Lakefront sounds blend seemlessly with stereophonic, electronic gestures, evoking images of northern journeys. A skillfully crafted sonic adventure. Improvised music/soundscape. Electric guitar distortions and modulated voices from the "natural" world meet the Korean avant-garde. Vigorous, bizarre and ultimately serene. Nilan Perera (guitar), Sarah Peebles (computer-assisted performance) and Jin Hi Kim (electric komungo) create spontaneously with calligrapher Chung Gong Ha. Electroacoustic tape. Dense textural landscapes shift from cascading crystalline timbres to complex colours, to layered women's voices. Heavily processed sounds slowly detune and converge. A sublime piece of experimental music. Improvised acoustic bass, electric guitar and voice. A beautifully simple, melodic line, accompanied by sparse harmonies and distant mutterings. Quiet, with a touch of nostalgia. Featuring Rob Clutton, Nilan Perera, and John Lennard. Electroacoustic tape. Subtle shifts of tone and timbre. Contemplative. Some might say ominous. A contemporary work with gagaku inflections (Japanese court music). Serene and elegant. A commanding performance on one of the most beautiful and transfixing instruments in history. **composed/recorded especially for "Whose Forest?" Reviews | Notable Projects | Resources | What's New?